For our March “honeymoon” getaway we did a one-day excursion. Yes, it wasn’t the prescribed full weekend away, but even a one-day excursion can do wonders for the soul (and for a marriage)! 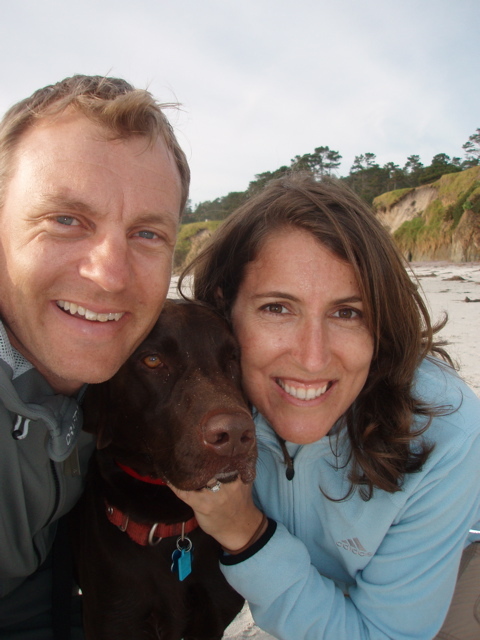 This was also our first big excursion with Sutter, so Carl did some research on dog-friendly sites in the area. 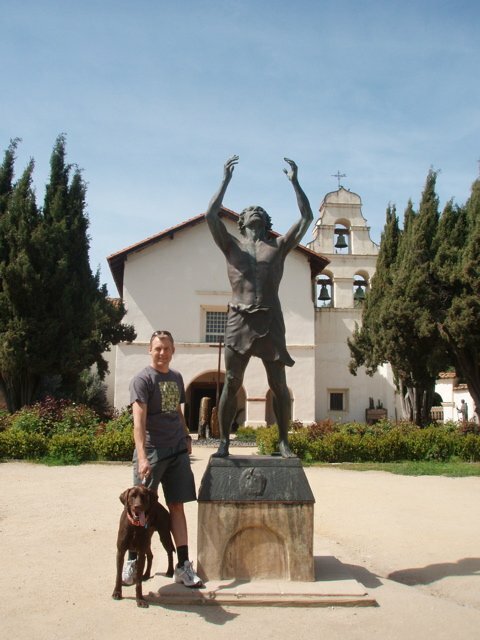 First, we headed south to Mission San Juan Bautista. Every time we drive by it on a road trip north/south on the 101, Carl says, “Oh, we should go there.” I think he secretly wanted to relive his glory days in 3rd grade when this mission was assigned to him for the California Missions project. Our niece, who is currently in the middle of this same assignment, prepped us for what she called a “crazy” statue in the courtyard. We arrived during the middle of mass on Palm Sunday, so we were able to see the beautiful stained glass inside. We pretended that Sutter would sit still with us while we set up a picnic on the lawn nearby. Carl is getting really good at holding Sutter’s leash and eating with one hand. We strolled through the small downtown past antique stores and a kajillion Harley Davidsons, poked our head in an art gallery, and tried to keep Sutter from his self-imposed choking while he dragged us along by his leash. Next stop. 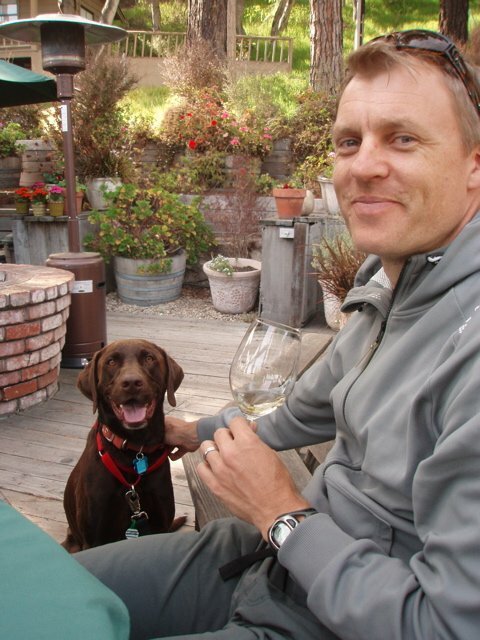 A dog-friendly winery just outside of Carmel. Ventana Vineyards has a great outdoor patio, but it was a bit noisy with planes coming in for landing at Monterey Airport, and trucks zipping by on Highway 68. The service was excellent, and so was the wine. Sutter was a good boy too. 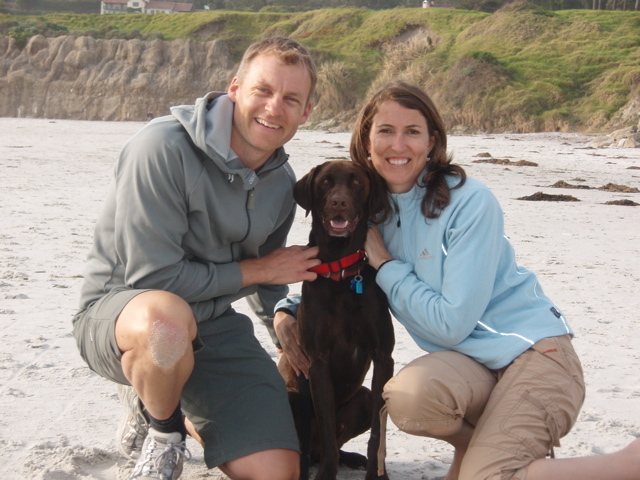 Sutter’s big adventure was when we took him off leash at Carmel Beach with the other happy doggies. We spent most of our time chasing after him, and hoping he’d slow down. During one of these chases, while Carl was disposing of the “yuckies” I noticed that Sutter was nosing his way into someone’s bag while the owner slept on his beach towel. As I got closer, I could see Sutter wolfing down the poor guy’s pizza! I panicked and secretly wondered if I could grab Sutter and sneak away without a confession. No such luck. I felt like I had a disobedient child. Okay.. he kind of is. Thanks to Sutter’s hint that he was hungry, we took him to a dog-friendly restaurant. Carmel is filled with them. Forge in the Forest set us up in a private dog-friendly patio with other dog owners, and introduce us to the special “Dog Pound” menu featuring everything from kibble ($2.50) to the Good Dog New York steak ($12.95) for dogs. We opted for the free treats. Sorry Sutter. 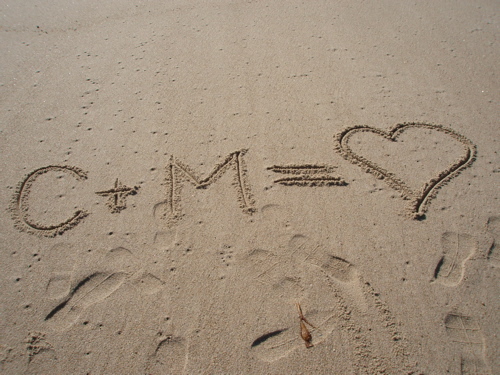 For our February “honeymoon” weekend, Carl and I ventured south to the Central Coast. When Carl originally suggested that we go to Cambria, I must admit that I scrunched my nose a bit. I’m sure I was just jealous, but when I was single, I’d get so bored hearing about all my married friends going to Cambria for a romantic weekend away, and I vowed that I wouldn’t do the same. Now I understand. Oh, how I love eating my words. 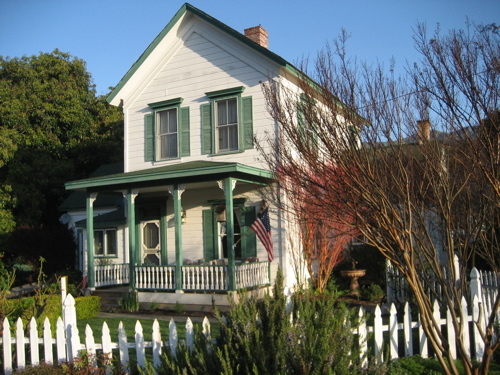 But it was easier to swallow when Carl said that he found a farmhouse B&B that was FIVE MILES away from Cambria. Nice. 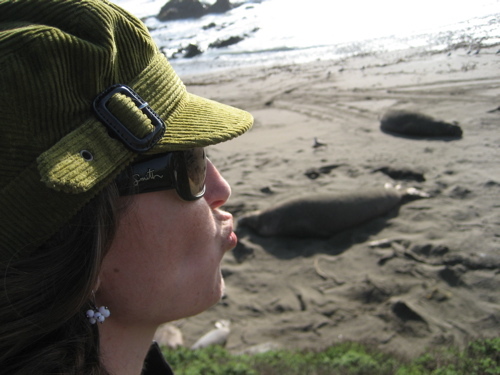 When we got to San Simeon, we had to say “hi” to the elephant seals. And… lucky for us, it was mating season. I won’t go into detail, but it was not rated G.
We stayed at the McCall Farm Bed and Breakfast and were greeted by two dogs and the amazing couple who runs the B&B. They joined us for their daily (and complimentary) wine and cheese hour while giving us tips on the not-so-touristy places to eat in town. The farmhouse is surrounded by a working farm, where the owners grow oranges and avocados. Surrounded by green rolling hills, it was an idyllic spot for a restful get-away weekend. We spent our mornings devouring the gourmet breakfasts and sipping coffee and reading on the front porch. In the afternoon, we took our bikes to tour the wine country of Paso Robles. And I thought Paso only had a huge McDonalds and Sizzler (from what I could see from the 101 freeway). I let Carl bike back to the B&B, while I drove the truck through this beautiful green landscape. Yep… the bike muscles haven’t quite gotten to the Carl endurance level yet, folks. And I am totally okay with that. Just to prove we were in Cambria, here you go. And you know what? I’d go back. What we’d bring with us next time: Some friends to enjoy the B&B with us! 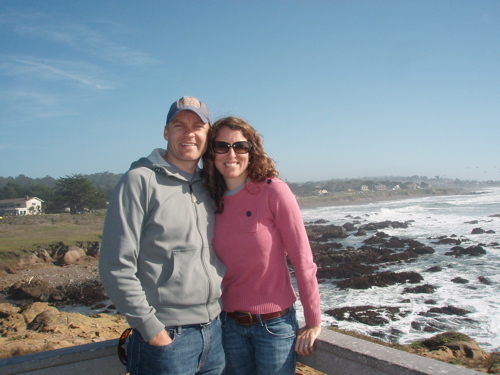 A strong piece of marriage advice we received from our pastor was to make sure we got away for one weekend a month during our first year of marriage – just the two of us. Twist our arms… we are trying to obey. I see these getaways like an extended honeymoon… hence the “January-Moon” name was born. Since I’ve been a little slow with the blogging lately, I figured I’d better post our January excursion before we take off for our next getaway this weekend. Perhaps these entries will be like a little travel-blog, and encourage you to go to some new places as well! 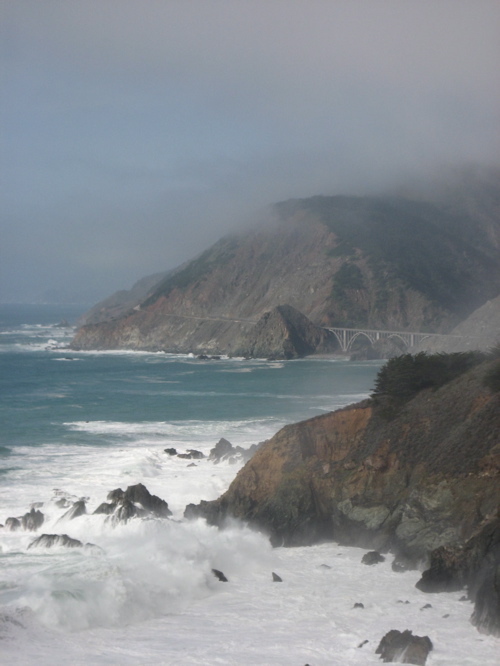 For our first excursion we headed north to Mendocino, along Highway 1. After about an hour of driving past super Wal-Marts and drive-thru Starbucks, we took a scenic route to Highway 1 past vineyards and farms and then, before our eyes, was the ocean. 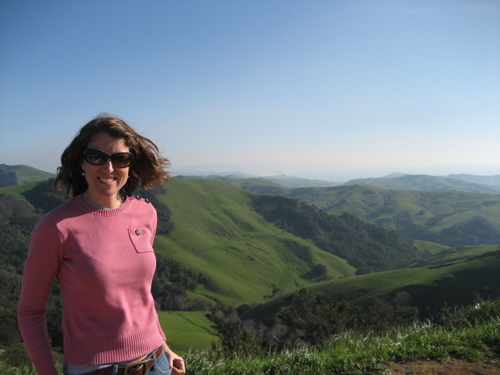 We could feel the frenetic pace of life just slide off our shoulders as we journeyed along Highway 1 where all we could see was ocean on one side, and beautiful green fields on the other. As we rounded a corner we came across these fine cows. I guess it is true. 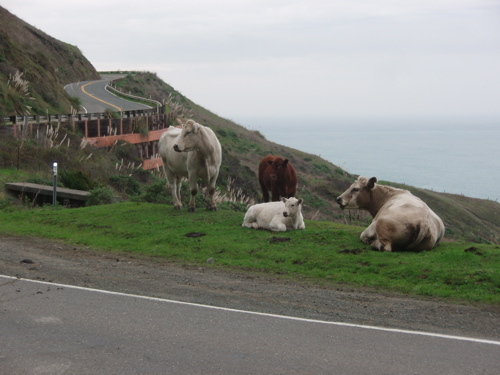 Happy cows do come from California. They were admiring the views just as much as we were. 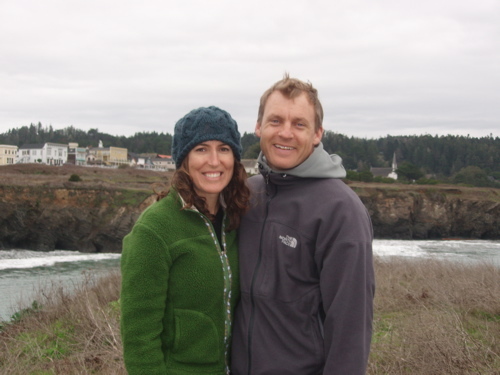 After a short hike and a picnic at the Point Arena lighthouse (click on this link for the awesome sound effect). we drove through the town of Elk, and continued on our way to Mendocino. Considered California’s New England, Mendocino is a cute little town with Victorian homes, art galleries, old water towers, and lots of cozy coffee shops. It’s nestled on a coastal bluff, with a redwood forest as its backdrop. Not a bad place to stay for the weekend… even if it was rainy and cold. 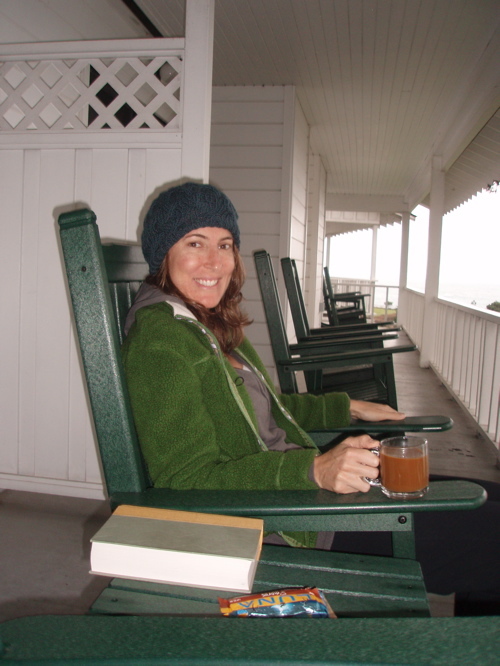 The rain and cold didn’t bother us too much because we stayed at The Little River Inn which had fireplaces in each room and a covered deck with rocking chairs, overlooking the ocean. I only wish we could have stayed longer. One night was just not enough. 2. I’m way behind on my blog. 3. I’m so far behind it’s hard to know where to begin. Rather than making this a 20-page essay of all that’s happened, I thought I’d just start with a few simple pictures. You know, work my way up to full blogger status just bit by bit. 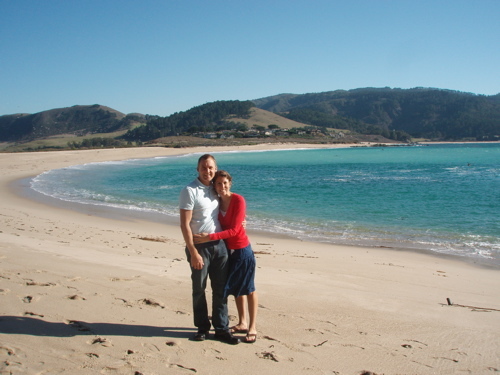 Here are some pictures from the first two days of our honeymoon in Carmel. I was starting to wonder why we were planning to leave the beautiful 75-degree weather, white sand beaches, and crystal-blue waters… and then I remembered. The water here is freezing! We couldn’t have asked for a better start to our honeymoon though. More pictures from Puerto Rico to come!